But really…what does it mean to live in the shroud of Grace? We've all made mistakes in life, and we all have those moments in time when we wish we could go back and change something we've done, right? I mean if we were really honest, there would be some silly things to change, AND some really painful things we've done or been victims of. At some level we have to be able to sit in the seat of grace for our actions. And at some level, we have to allow that grace to fall on others. I know it's super hard right? We have this inner voice that wants to come in and judge and condemn someone for what they've done, because somehow it makes us feel like we're doing life better than "them." But what if we lived in a world that could recoil from the fear of allowing grace to fall on people we interact with. If mistakes were just that….mistakes. I've recently been involved in a story where a youth minister was away from his home church. He was actually celebrating life with some friends far away. He was in a compromising situation, and decided to compromise on a certain youth ministry standard and did something that didn't effect his ministry at home, didn't effect his commitment to purity sexually, and didn't really do that much to effect his ability to connect with kids. (for the sake of the innocent I won't reveal the name or situation, but you get my point.) This guy involved in ministry crossed the letter of the law, but he didn't endanger the spirit of the law. And you should see how the pastors are dealing with it. It's almost as he ruined the whole of the reputation of the ministry. They're making him come back and pay penance, they're calling him out in front of others, and they've turned this minor situation into a MAJOR issue that could have been solved if they had a CLUE what it means to live in grace. Sure, we have a responsiblity to have teaching moments. Yes, we have the duty to make sure we're living about our own code of ethics and morality. But when it's something SOOOOOOO insignificant that becomes the focus of this guy's ministry or the ministry around him we've lost sight of the Bigness of God's Grace. 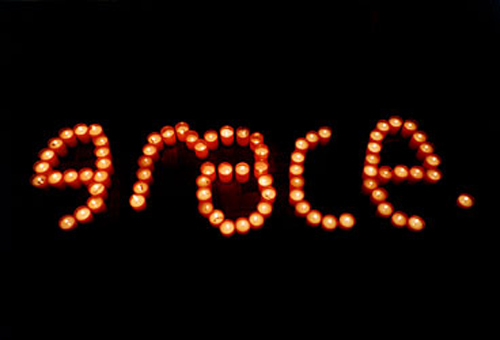 Let us be a people who through our lives can model the calm peaceful notion of God's grace over our lives. It is the power of Him working through us, and is inexplicable to the modern world. It is the power to remove feelings of failure, insignificance, and ultimately our illusion of control. We are a people who need it. We need to know and feel the shroud of God's grace in our lives everyday. May you experience His grace in your life today, and may you extend the same fullness of grace to those around you.